Many times people think that volcanic eruptions affect the economy through the destruction inflicted upon the landscape during an eruption: lahars and pyroclastic flows destroying bridges and homes, ash ruining crops and water, lava flows overunning communities. However, in Hawai’i, a new effect of volcanism has been seen in the agriculture of the state. The volcanic fog – or “vog” as its called – has been causing major problems with farms on the Big Island of Hawai’i. Since the new activity at Halemaumau (see above) began last year, Kilaeua has been spewing much larger volumes (2-4 times more) of volcanic gases such as sulfur dioxide, carbon dioxide, water and carbon monoxide than in previous years. These gases form a brown fog that is caustic to most animals and plants. The sulfur dioxide, in particular, has caused many crops to fail thanks to the production of sulfuric acid with the sulfur dioxide interacts with water – think of it as a very concentrated version of “acid rain” that is seen in the eastern United States. The solution to this would either be to build “vog-proof” air-filtering greenhouses or planting a limited set of plants that seem to withstand the effects of the vog. Alternately, one can hope that the gas emissions from Kilaeau will return to lower levels, allowing for the plants to survive. In any of these cases, the growers on the island face a large financial hardship in order to keep their businesses alive in the face of the volcano. This passive destruction of plants by Kilaeua shows how even when a volcano seems to be benign, it can inflict millions of dollars of damage on the local economy. The people who remain in Chaiten face the potential for a devasting pyroclastic flow, so says Jorge Muñoz of the SERNAGEOMIN in Chile. The volcano is still producing large ash columns on Tuesday and a flyover of the dome forming inside the caldera has lead to the concern that a collapse on a larger scale than those seen last week could wipe out the town for good. It gets even uglier here from the Undersecretary of the Interior. It seems that both sides are digging in the heels, so to speak. So, there has been a lot of talk about “volcano monitoring” over the last 24 hours, now hasn’t there? Now, I’m not going to revisit this discussion, but as an example of why it might be important, there is an article today about the location of the Bataan Nuclear Power Plant in the Philippines (near the potentially active caldera Natib). These are the sorts of issues that need to be dealt with in regards to volcano monitoring – the cascading effect of an eruption. During the 1980 eruption of Mt. Saint Helens, there was a chance that volcaniclastic sediment from the eruption could have dammed the Columbia River and cut off/limited cooling water to the Trojan Nuclear Power Plant nearby (see Beaulieu, J. D., and Peterson, N. V., 1981 pdf). We all have different political views on how to help the U.S. economy. However, Stimulus Bill or not, it is irresponsible to put into the public consciousness that volcano monitoring is “wasteful” spending – and this is how it could be perceived. It is also been shown that monitoring volcanoes ends up saving much more money than it costs. I am sure there are plenty of other 0.01%s of the Bill that are much more wasteful but don’t add to the overall anti-science rhetoric in which this country is mired. //Below are the comments for this article from the previous home of the blog. It is not just monitoring that is important. There is still much to learn about how volcanoes behave and there are potentially dangerous phenomena that have yet to observed in action and can only can be examined by studying the geologic record. Such studies do require some spending, but the cost is small relative to what the cost if something unexpected occured and thus no warning could be issued. Tied into this is the fact that what a volcano did in the past is an indication of what it could do in the future. There are many volcanoes still awaiting detailed study and these could be potentially dangerous. Therefore basic field mapping and petrology are very important and need to be funded. And while I’m on a soapbox taking up bandwith: it is not just politicians, but the academic departments that have declared subjects like volcanology, mineralogy and petrology are no long needed as core geologic disciplines. The refrain “nobody does that anymore” is heard from such places and simply adds to the problem of scientific ignorance when they grant “geology” degrees to people ignorant of these fields. Isn’t this what has happened with Mount St. Helen’s? There is still a program in place, but funds are dwindling? Here in Canada, we don’t bother with such things, even though we do have active volcanoes. Ignorance is bliss. SANTIAGO (Reuters) – Chile’s Chaiten volcano, which erupted spectacularly last year, spewed a vast cloud of ash as well as gas and molten rock on Thursday in a partial collapse of its cone, prompting a fresh evacuation. 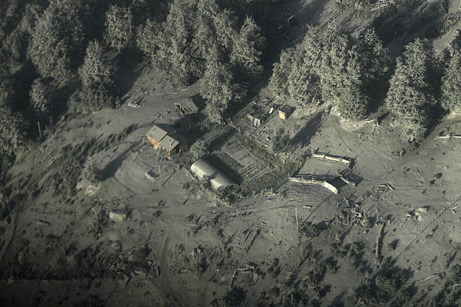 Television footage showed a cloud of ash billowing into the sky over the town of Chaiten, which lies about six miles from the crater. Authorities evacuated 160 people from the area. Around 7,000 nearby residents were evacuated last year after the volcano, dormant for thousands of years, erupted. The government is planning to relocate the town. Officials from Chile’s national emergency office, Onemi, flew over the volcano and saw a kilometer-long crack in the cone of ash that has steadily grown in the crater, part of which has collapsed. “Large quantities of gases and pyroclastic material were observed,” Onemi said in a statement, adding that rains in the area combined with the ash could cause flooding in and around the town of Chaiten, located 760 miles south of the capital Santiago. However, while there was a large volume of ash, there had been none of the earth tremors or groaning sounds that accompanied the initial eruption last year, it said. Interior Minister Edmundo Perez Yoma ordered all government personnel out of the area, and called on around 30 to 40 civilians who refuse to leave to follow suit. The government insists on moving the entire town. But some residents vow to stay put and are unfazed. “I looked up and saw a tremendous column (of ash), just like in the beginning, one-and-a-half kilometers high,” Claudio Chelgui, a resident who decided to return to Chaiten despite government warnings, told local radio. “We have repeatedly said there is a red alert and that people should not be there, and if that had been respected, then police would not be evacuating people,” an Onemi official said, asking not to be named. He said the volcano has been in a permanent state of eruption since May of last year, when a cloud of debris soared as high as 20 miles into the air. The cloud was kept aloft for weeks by the pressure of constant eruptions, covering towns in neighboring Argentina with volcanic ash. Chile’s chain of volcanoes, the second-largest in the world after Indonesia, includes some 2,000 — of which 500 are potentially active. David – I’ll check on this, but that sounds suspiciously like an article I read last week when Chaiten erupted. Anybody else hear anything about more eruptions/collapses at Chaiten today? Not entirely on-topic, but there’s a video at the BBC showing what is presumably the latest eruption of Chaiten. Unfortunately, the accompanying article is quite uninformative. Jindal is not a stupid man and probably is not really against scientific research. He is creating a certain image as a politician and thus can never admit that publicly. His comments were directed specifically at a constituency that is either anti science or hates anything Democratic. He wants to gain their support for a presidential run. Expect him to continue blasting away with his political rhetoric regardless of truth, accuracy or factual basis. He wants to leave a specific impression in the minds of that unique constituency, of which, sadly there are many. Many like me will reject him, but there are plenty of our fellow citizens that will delight in his attacks and become even more ardent in support of him. Nothing new at Chaiten today, Erik – which is to say, the dome is still growing, steaming and fuming, blocks and ash roll down its slopes pretty much continuously, and small collapses and explosions occur every few hours. But no big collapses or upsurges in activity so far today. The Reuters report quoted above refers to the 19 February collapse. Just because I’m a Republican with political agenda gives me the right to endanger thousand or even millions of other people. Well, I am a Republican with a political agenda. I think you guys are missing the point. I think volcano monitoring is something we need to do, probably a lot more. (My undergraduate degree is in geology). The question is whether or not it is “economic stimulus.” Volcano monitoring is not. The person to be mad at is the person who added it to the stimulus bill. There are a million things that more money needs to be budgeted for. This should have been in the regular budget, not this emergency package. We are borrowing this money from our children. If we need more geological monitoring of volcanoes, earthquakes, etc. (and we do) it should go through the normal budget process. Lance, what I remember about Jindal’s speech is that he called volcano monitoring “wasteful spending.” He wasn’t implying that it didn’t belong in the stimulus bill, he was stating that we shouldn’t be spending money on it at all. Volcano monitoring, by the way, is stimulus. The folks at Trimble (who recently laid off workers) would be happy to sell the USGS more GPS instruments, for example. How is buying goods and services not stimulus? All spending is “economic stimulus” in the broadest sense. Galeras, in Colombia, appears to have entered a new cycle of activity as it has erupted for the second time in a week. A large explosion occurred this morning that was accompanied by falling ash and rocks (ballistic bombs) from the event. It is unclear how far the volcanic products travelled from the vent, but Colombian officials did raise the alert level back to red and ordered new evacuations. I found this little press release that doesn’t have a huge amount of information, but is interesting nevertheless. The Coordinating Committee for Prediction of Volcanic Eruptions of Japan (nice name) is putting seven volcanoes on “24/7” monitoring. That sounds like we might see a lot of eruptions in Japan soon … except that their rationale was that these volcanoes “are likely to affect public life by erupting or becoming active in the coming 100 years”. That is quite the window of eruptive opportunity! The question is what exactly “24/7” monitoring – does this mean that someone/something will watch seismicity for signs of activity, or will this be a dedicated position that coordinates seismic, gas and deformation monitoring? The article doesn’t say much beyond seismographs and (vaguely) GPS. Nor does it mention what the seven new volcanoes are beyond Mt. Shirane and Mt. Norikura. However, I do give Japan credit for having such foresight when it comes to potential volcanic hazards. One volcano that is already being constantly monitored is Mt. Asama, which has been erupting for over week. However, folks are already wondering when officials will say that Asama is “back to normal”. You can get a good idea of the ash dispersal from Asama with this excellent satellite image (above) from just after the January 21, 2009 eruption. UPDATE 2/15/2009 20:30 PM: Marta Calvache of INGEOMINAS says that seismicity has all but stopped at Galeras after the eruption Saturday night, however the area will be kept on alert for more potential activity. However, even with the eruption, apparently there are very few people in the evacuation centers – never a good sign if something really big were to happen at the restless Colombian volcano. Last night, Galeras, near Pasto in Colombia, erupted, prompting an evacuation of nearly 7,000 people living near the volcano. The first CNN article linked above, for some reason, says that Galeras is not in a “heavily populated” area, however over 500,000 people live in or around Pasto, which is quite close to the volcano itself (see the CCTV video footage or the picture above for evidence). The current eruption has blanketed Pasto in “abundant ash” (according to the mayor of Pasto), where there have no been reported injuries or death, however, they did have to close down two water treatment plants. Beyond this, not too much is known about this eruption as it is cloudy and rainy near the volcano. That being said, with this much ash being deposited, there is likely a plinian component to the eruption, making it likely to have been a larger eruption than many of the recent events at Galeras, the last ending in January 2008 (VEI ~2). The NASA Earth Observatory website posted this great image of Redoubt taken from Landsat images in 2000. You can see a few neat things. The main thing I notice is that the Drift River Oil Terminal is in about the worst place you could put an oil terminal near a volcano like Redoubt. All the material from recent eruptions at Redoubt get focused down into the Drift River, which then heads off into the Cook Inlet via the Drift River flood plain (upper right hand side of the image). When this image was taken, the Drift River is still grey with volcanigenic material even 10 years after the last activity, showing that most of the material is mobilized in that direction. It still amazes me that the oil terminal was ever allowed to be built in that location. As for the current state of things at Redoubt, AVO reports that the seismicity is still going and things remain much the same as it has been for the past few weeks. Officials on the Kenai Peninsula are assuring residents that they’re ready for an eruption. At this pace, they might have months to prepare! A week ago, if you asked around, I’m sure most people would have thought Redoubt would have erupted by now considering all the seismicity and melting that was seen at the end of last week. However, volcanology is not an exact science, and here we are continuing to watch Redoubt tease us with signs of pending activity. New holes have appeared in the snow that caps the volcano, the seismicity continues and the volcano is still spewing sulfur dioxide, carbon dioxide and hydrogen sulfide – all signs that magma is intruding the volcanic edifice. However, as on this morning (2/5/2009), the volcano has yet to erupt. Some news from earlier in the week is that the US Air Force has moved many of its aircraft from the area of Redoubt to Washington state, apparently not wanting to play the waiting game like it did during the 1991 eruption of Pinatubo near Clark Air Base. Also, an eruption of Redoubt might also have a larger effect on air cargo rather than air passenger traffic, with one of the largest air cargo hubs located in Anchorage. UPDATE 9:20 AM 2/5/2009: Read into it as you will, but Redoubt’s activity is in “slight decline” according to AVO. Mt. Asama near Tokyo did, in fact, erupt within the “two day” window predicted by the Meteorological Agency of Japan. The reports this morning put the ash column at ~2,000 meters (~6-7,000 feet), so relatively small, but big enough to dust parts of Tokyo (~145 km away) with ash. No evacuations are planned for the area around Asama, but people who live within 4 km of the volcano are to “take caution”. There are also new reports that Mt. Sakurajima in southern Japan erupted yesterday. Block were thrown up to a few kilometers from the volcano. The article suggests that ash spread as far as the Philippines and Vietnam, but I have yet to find any other data to back this up. The same article also mentions that Karymsky erupted overnight as well. The impression I get is that they got all this information from the Tokyo VAAC when they were researching the Asama eruption, so few details beyond “ash” can be found. Of course, with all these other volcanoes picking up the slack, Redoubt remains recalcitrant in its activity. There was no eruption over the weekend and the latest AVO has to offer is the news of an intense jolt to the volcano early this morning, but no eruption thus far today. UPDATE 2/1/09 5:02 PM Pacific: Indeed, Asama did erupt today. The eruption was relatively small, throwing ballistic clasts up to 1 kilometer from the vent and ash into the outskirts of Tokyo. Redoubt in Alaska has dominated the volcano news as of late, but it is clearly not the only volcano on Earth that is showing signs of eruption right now. The Meteorological Agency in Japan has just raises the alert level at Mt. Asama and warn that the volcano could erupt in the next “two days”. Asama is ~150 kilometers from Tokyo and is very active (see above), having last erupted in September 2008. The volcano has had heightened seismicity for the past few days that led to the increase in alert level. When Asama does erupt, the products tend to be explosive and are accompanied by dome growth (similar to other Japanese volcanoes like Unzen).